Of all the bandits and train robbers in the long and bloody history of the railroad, none were so feared as Neo and Báy B. Catus. Entire armies had to be enlisted to protect trains running through the areas they were known to frequent – and those areas were many, for the Catus siblings were fast as the wind. Soldiers and mercenaries fought to keep them off the train, knowing that once the two of them were inside, it was too late. Their lethal combination of purring and scratching, of devious insinuation and adorable cuteness – often referred to as the “Good Cat, Bad Cat” method – could not be resisted. From healthy tuna to delicious treats, nothing was safe. Even money (for buying tuna) and gold (for buying treats), often neglected by more mundane feline criminals such as cat burglars, would be stuffed into a bag and taken along. Quite often, it is said, the passengers of the train would be forced out of their wagons and into the heat of the desert. The two robbers would then proceed to carefully wreck the train’s interior, scratching the seats and chewing on the curtains, covering every corner in impossible-to-remove hair and leaving inexplicable bits of crud that scientists would take years to identify, only to go mad when they learned the truth. In saloons people would fall silent when the Catus siblings entered the room, bartenders hastily pouring them bowls of the best milk in the house; law enforcement officers trembled in their presence and hid their weapons, lest they unleash the fury of the Claw. Only in cat houses was there joy when they arrived. But why all this hatred for trains? Why all this destruction? Why the hair, the scratches, the targeted urination? 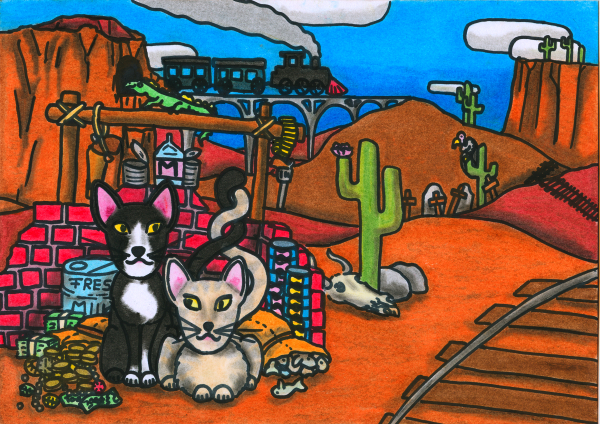 As was later revealed, when the Catus siblings retired from train robberies and went to live in Katsouli, where they are seen as heroes, in one of his earthly incarnations Neo suffered a deadly encounter with a locomotive, cutting short his stay in that world when he was having a rather good time. While cats are known to shrug off death as a minor inconvenience, they are also rather vindictive, and do not appreciate having things taken away from them. And while most witnesses agree that Neo Catus was a goofy, affable sort of cat, there are some things no cat will accept. So that was the reason for the robberies – that and the fact that Báy B. Catus is a greedy little beast of a cat who loves to eat. In time, however, revenge – like all toys – grows boring, and so the Catus siblings got out of the train game. They donated half their tuna to the Fund for the Development of New Ways to Annoy Humans (FDNWAH, an acronym inspired by the sound a human makes when awoken by an extremely overweight cat jumping onto his or her belly) and moved to the rolling green hills and endless sandy beaches of Katsouli, where time is of little consequence and napping is appreciated as the artform that it is. This entry in the Oneiropolis Compendium was made possible by an anonymous supporter from a mysterious pickerel-related place.